As far back in my life as I can remember, Spider-Man has been a part of who I am. Spidey was fundamental to my understanding of what a hero could be, who lived behind the mask, and how they would face their struggles. Spider-Man: Into The Spider-Verse understands that this is one of the greatest strengths of the character, and the creates a unique movie experience that absolutely blew me away. With action, laughs, and engaging characters, it delivers across the board with delights for fans new and old. 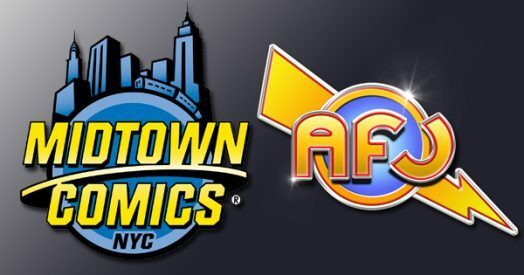 Open up a MIDTOWN COMICS account today for amazing deals on everything the JUNKIEVERSE loves. 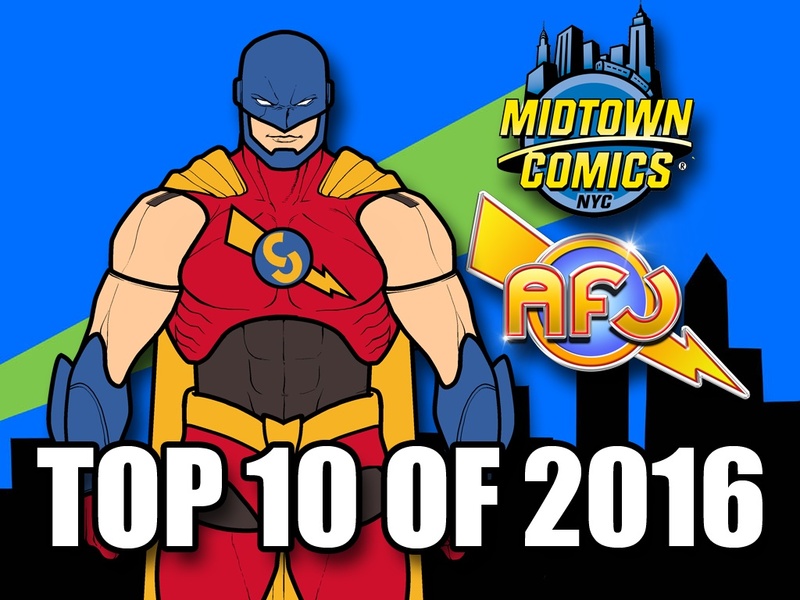 The NYC institution is the top comic book shop in the country that I have been shopping at for 18 years. If you cannot make it to one of their three NYC-based locations, then open an online account via Facebook and get all of the perks of being a MIDTOWN customer that lives in the city that never sleeps. 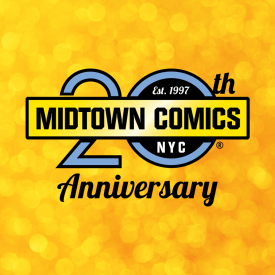 After two decades, the powerhouse retailer still gives you $20 off for every $100 you spend on comic books making MIDTOWN COMICS a goldmine on not just new comic book Wednesdays but any day that ends with “day!” Oh and did I mention there is an entire floor of toys & collectibles? You guys may have heard that SPIDER-MAN: HOMECOMING is kind of a big deal. The House of Ideas and the coveted MCU has moved into their next phase after almost a decade of feature films and their first solo Spider-Man film with the full weight of both MARVEL & SONY. I loved the film so much that I have been working on an exhaustive spoiler-filled review for five days because I was just that floored at how, pardon the pun, amazing the film was. People were actually clapping in the theater at a late show, not little kids. Adult fans enamored that the definitive version of Spider-Man has finally been produced. For me, that means one thing: new toys! 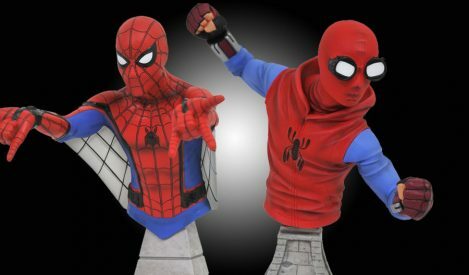 The Ferrari of high end action figures from HOT TOYS is up for pre-order and you will be hard pressed to find a better figure from the new Spidey film reboot. 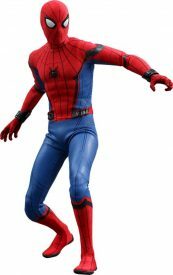 The figure is movie accurate in every possible way with a scarily lifelike likeness of Tom Holland with interchangeable head sculpt, a sweet set of magnetically attachable web-wings (awesome) and the usual bells & whistles Junkies have come to expect from HOT TOYS. The foundation of the MCU is no doubt Robert Downey, Jr.’s Tony Stark/Iron Man that has gladly picked up the mantle of being the brilliant father figure that Peter Parker desperately needs. 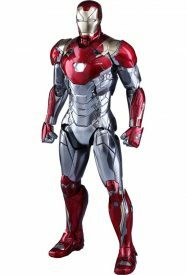 RDJ does his usual suave job of stealing most scenes that he is in with his impressive new MARK XLVII armor that Junkies are going nuts over. Leave it to the comeback kid that is Downey, Jr. to be the anchor of MARVEL’s multi-billion dollar film franchises. Now, this amazing die-cast piece from the house that toylebrity Howard Chan built can be all yours! I was so psyched to hear as the movie approached the multiplexes that NECA was releasing one of their 1/4 scale figures this Fall. As a more affordable option for Junkies, NECA’s 1/4 scale figures are no joke and are some of my favorite personal display pieces in my collection. I love that the New Jersey based toy-makers are dipping their toes more into the MARVEL pool as they also have impressive movie versions of DOCTOR STRANGE & CAPTAIN AMERICA coming in 1/4 Scale form later this year as well. And NECA does not skimp! 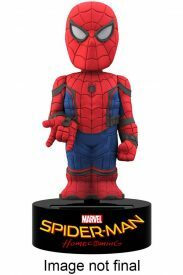 You get an amazingly detailed figure with over a whopping 30 points of articulation, 5 pairs of hands, interchangeable eye lenses that include Spidey’s signature movie eye expressions courtesy of Stark Industries. Cannot wait for this! You would be hard pressed to find a hotter toy brand in 2017 than MEZCO’s wildly popular ONE:12 COLLECTIVE. Now, the iconic debut of Spider-Man from AMAZING FANTASY #15 is recreated in this gorgeous new figure from the house that Mez built. Each successive ONE:12 COLLECTIVE series piece released from MEZCO has consistently sold out on their website so getting in on this figure early is a wise investment for any serious Webhead. 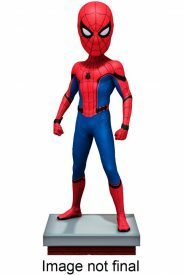 Throw in the ONE:12’s over 30 points of articulation, a brilliantly MEGO-style silk screened tailored costume and an alternate head, this figure of Spidey’s first appearance is a must have. I received this figure as a gift for my birthday last year and it wound up making my Top 10 List of 2016! What is cooler than Spider-Man from Queens, NY? How about a super-bada$$ Manga Samurai Spider-Man from Feudal Japan?!? That’s right, this figure takes you back to the awesome kung fu days of yore with a MARVEL spin. 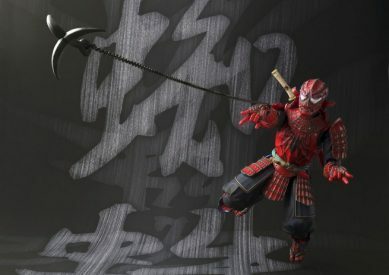 The Tamashii Nations figure is made with a Spider-Armor like we have never seen before and some amazing gadgets including my favorite, a “Kaginawa-Style” grappling web hook to reign in the bad guys. Tons of extras and accessories at a price that won’t knock you over the head. 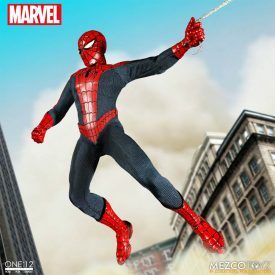 Alternate costumes have always been a part of Spider-Man’s ever-changing wardrobe because of his multiple team affiliations and general consistency in getting himself in trouble, but the HOMECOMING Homemade Suit has really taken off in popularity with the Junkies. 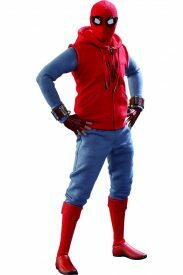 The Parker designed suit definitely has a vibe of the famous Scarlet Spider suit from the comic books but with the colors mixed up and red being the centerpiece over blue. 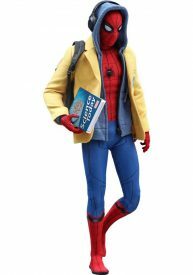 Still, this is just a beautiful figure with a newly developed Peter Parker head sculpt based on Tom Holland and 3 sets of interchangeable eyepieces when the Midtown High student’s senses are on overload! I love NECA’s SCALERS as they are great little gifts that pack a nice punch of design and artistry in a mini-character. 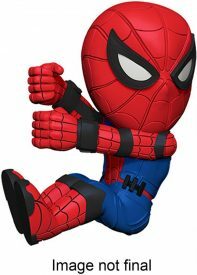 While they are only 2-inches tall, they attach to all sorts of headphone cords, cables & straps for your electronic devices making them the perfect conversation starter while you are rocking out to the new iteration of the 60’s Spider-Man cartoon theme! NECA will help you appease the kids with this under $20 BODY KNOCKER and they really are a lot of fun. In fact, I ordered one for a friends desk in their office because they stand a solid 6.5-inches tall and seem to always be moving from side to side when exposed to light. Needs no batteries, is powered by the sun, and makes the work day that much more tolerable! The whole “What is Spidey doing in a yellow jacket?” controversy that stumped us all has finally been solved. And I have to say that the whole Washington, D.C. scene was pulled off with originality and flair while examining a torn Peter Parker coming into his own as both a man and a superhero. 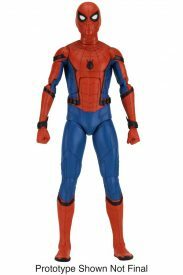 The Deluxe Version of this SPIDER-MAN: HOMECOMING figure is a stunning achievement combining so many different elements of modern high end action figure production while maintaining the amazing quality that we have come to expect from the pioneers at HOT TOYS & SIDESHOW COLLECTIBLES. In addition to the aforementioned yellow blazer, Peter has his zip-up hoodie (his only sign of brooding in the whole film) and a not-in-picture but highly detailed helmet of Michael Keaton’s Vulture! Epic! The NECA HEAD KNOCKERS are back! And what better way to celebrate than with a new 8-inch tall head bobbling action piece of movie history? This piece is cast in high quality resin AND hand painted for maximum detail with a dope looking NYC-inspired building ledge base. NECA also provides the distinctive Junkie with collectible matte finish packaging they know we go nuts for along with spot gloss. Sweet! 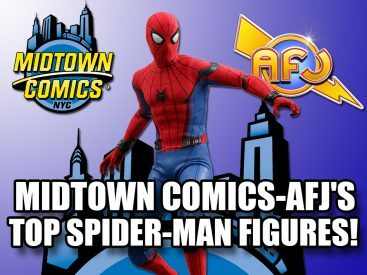 By the time that you are done playing with these amazing toys that MIDTOWN COMICS offers, you may be tuckered out and want to read all about the production design and art of the new MCU blockbuster. 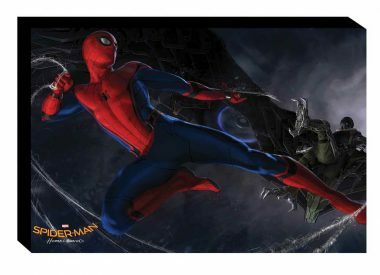 The continued keepsake volume of MARVEL’s popular “ART OF” collection, go deep into the minds of producer Kevin Feige & director Jon Watts to get a peek at exclusive concept art, production stills and top secret commentary from the MARVEL & SONY execs! We’re celebrating the brand new Spider-Man Homecoming movie with an absolutely amazing contest! 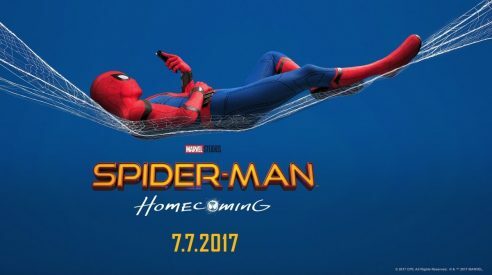 Fans can enter to win a PAIR of tickets to a screening of YOUR choosing for Spider-Man Homecoming at the incredible Alamo Drafthouse Greater NY in Yonkers! POLL: Best new trailer! Vote! 2017 has already been a great year for movies – Logan was incredible and LEGO Batman was a bunch of fun! 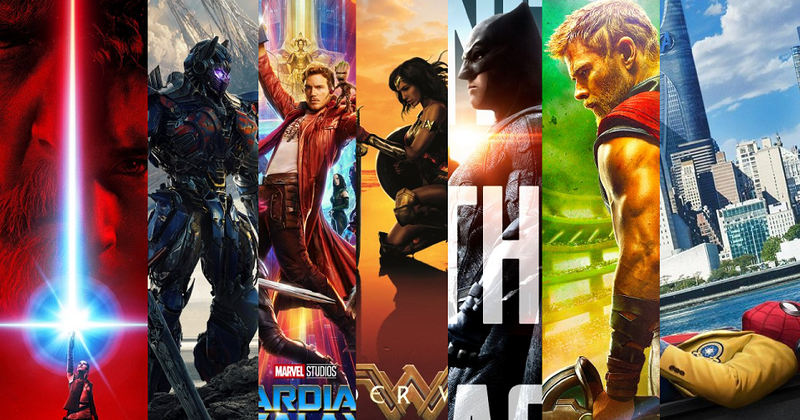 Plenty of movies are still on the way, and thankfully for us, some pretty awesome trailers have been released! However, we’re curious… which trailer do you like the most? Watch all of ’em below and then vote in the poll at the very bottom of the page! Editorial: Does a Venom Movie NEED Spider-Man? “Do you need Spider-Man in Venom’s first movie?” I’m guessing 9 out of 10 comic book fans will quickly answer “yes” to that question. After all, Spidey plays a huge role in Eddie Brock becoming Venom (read Amazing Spider-Man #300), and then the wall-crawler continues to play a big part in Venom’s story. The frightening foe’s a twisted reflection of the friendly hero and the two have had their fair share of memorable stories over the years. Like it or not, they’re strongly connected. That said, can you rework Venom’s story to not include Spider-Man? Yes, it’s definitely possible. Should you, though? Well, that all depends on what they’re bringing to the table, doesn’t it?